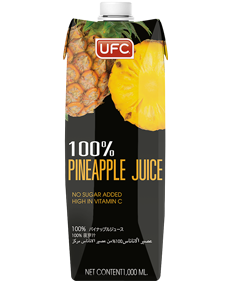 UFC 100% Pineapple juice is made of pineapple juice and small pieces of pineapple which creates authentic tropical pineapple flavours and sweet fragrances. Moreover, UFC 100% pineapple juice is filled with health benefits such as Vitamin C and fibers. This product does not contain any preservatives, sugar and food colouring.